The system treats wastewater from a combined sewer system. All values (inflow/outflow) in mg l 1. Raw sewage is pretreated in a 2 m3 sedimentation tank. 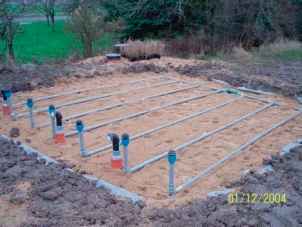 Settled sewage is pulse-loaded onto the surface of the bed by a level-controlled pump. Treated effluent is collected in a system of drainage pipes, and half of the effluent is recirculated back to the pumping well (or to the sedimentation tank). From Brix H (2005) The use of vertical flow constructed wetlands for on-site treatment of domestic waste water: New Danish guidelines. Ecological Engineering 25: 419-500.
important factors to achieve in the design of a VF are (1) to produce a bed matrix that allows the passage of the wastewater through the bed before the next dose arrives while at the same time holding the liquid back long enough to allow the contact with the bacteria growing on the media and achieve the required treatment; and (2) to provide sufficient surface area to allow the oxygen transfer to take place and sufficient bacteria to grow. All VF systems are dosed intermittently, typically once per hour but it may be more often. It is essential to achieve quick cover of the surface in order to trap air in the interstices in the bed. In most VF systems the real distributor is the layer of carefully selected sand which first allows flooding of the surface and then gradual see page down through the depth of the media. The vast majority of the VF systems employ a network of pipes with small holes across the surface area of the bed (Figure 25). The distribution pipes could be insulated by a 0.2 m layer of coarse wood chips or sea shells on the surface of the filter. It also possible to distribute waste water from open ended pipes onto the bed (Figure 26). The area of the immediate vicinity of the discharge should be protected by some paving or tiles to prevent the wash away of the sand or gravel. The size of VF CWs is usually based on the hydraulic loading rate (HLR). The maximum HLR that can be achieved without surface flooding will be affected by many variables but is most strongly related to media size and distribution, rate of biofilm growth, and hence the BOD5/organic mass loading rate and suspended solids loading rate. The Danish guidelines suggest that the filter medium is sand with a d10 between 0.25 and 1.2 mm, a d60 between 1 and 4 mm, and uniformity coefficient (U = d60/d10) should be less than 3.5. The contents of clay and silt (particles less than 0.125 mm) must be less than 0.5%. 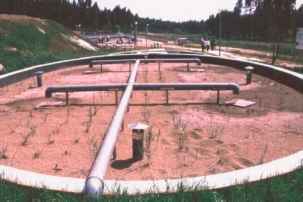 Figure 25 Network of distribution pipes at single house VF CW Astrup, Denmark. Photo courtesy Hans Brix and Carlos Arias. Figure 26 Open pipe distribution of wastewater in VF CWs Leiria, Portugal. 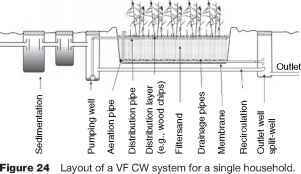 The VF CW is a middle part of the treatment system for landfill leachate. Photo by J. Vymazal. The data on maximum HLR vary widely in the litera ture. However, it seems that VF CWs can operate in the range of 200-1200 mm d and usually no clogging pro blems occur below 800 mm d of pretreated wastewater. The organic loading rate should not exceed 25gCODm 2d 1 in order to prevent clogging. The area used for VF CWs varies between 0.9 and 5 m2 PE 1 (PE = population equivalent) but most systems are designed with the specific area 2-3m2PE 1. 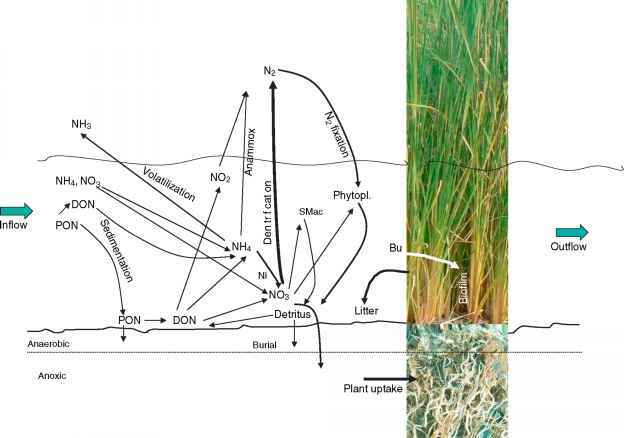 Stems are usually designed as a single unit, larger systems may have several beds which are fed with wastewater in rotation. Also, some larger systems have two stages of vertical beds in operation. Plants play a very important role in VF CWs. They stabilize surface of the bed, their roots and rhizomes positively affect the hydraulic conductivity of the filter and movement of aboveground stems helps to prevent clogging. The aboveground biomass provides insulation of the bed and belowground organs provide substrate for attached bacteria growth. The oxygen transfer to the rhizosphere is limited but creates microzones where aero bic bacteria can be present. The vast majority of VF CWs is in operation in Europe and the most commonly used plant is P. australis (Common reed).